Zillow shares plunged 9 percent on Friday after the online real estate database company announced it will begin buying and selling homes, a capital-intensive endeavor. With Zillow’s new program, announced on Thursday, home sellers in the test markets of Phoenix and Las Vegas will be able to use Zillow’s platform to compare offers from potential buyers — and Zillow. When Zillow purchases a home, it will aim to quickly flip the home, making updates and repairs and listing it as soon as possible. An agent will represent Zillow in each transaction. But investors are less enthusiastic. Flipping homes, a model that’s being utilized by start-up Opendoor, is very different than operating an internet marketplace. It carries additional risk associated with buying and selling homes and requires a hefty investment in operations. And it also potentially puts Zillow in direct competition with the realtors on its platform. Zillow sank $5, or 9.3 percent, to $48.77 as of mid-day on Friday, knocking more than $900 million off its stock market value. That’s a lot of money to bet on…well, what exactly? What kind of company is Zillow today, and what kind of company does it hope to be in the future? Where, then, does Zillow fit? It certainly has the hallmarks of an Aggregator: users go to Zillow directly to look for homes, Zillow incurs zero marginal costs to serve those users, and the company has created a two-sided market where its suppliers (home sellers) are incentivized to come onto the platform on Zillow’s terms in order to reach Zillow’s end users, thus making the platform more attractive to those end users. The question of supply is more complicated; in North America real estate listings are gathered in hundreds of local multiple listing services (MLSs) run by local realtor associations, and access is restricted to brokers in that local region. Redfin got access to those listings by becoming a broker itself, but Zillow, at least at the beginning, relied on brokers uploading listings themselves — which they were willing to do, thanks to the userbase Zillow had already built up thanks in part to its Zestimate house valuation tool. This was Aggregation Theory in action: gain users with a new kind of user experience, then leverage that user base to get suppliers to come onto your platform on your terms, further improving the user experience. And, eventually, Zillow was able to parlay that user base into direct access to those MLS services, first via the owners of Realtor.com, and then, when they pulled the agreement, via local MLSs and brokers directly who understood how important it was to stay on Zillow. Interestingly, this means that Zillow arguably started out as a Level 3 Aggregator, and then stepped down to a hybrid of Level 1 and Level 2: cutting all of those deals is expensive, and the company does pay for the data, but it’s not exclusive by any means. And this, by extension, gets at why Zillow, despite having so many of the characteristics of an Aggregator, just doesn’t seem nearly as important as companies like Netflix or Airbnb or Facebook: it has accommodated itself to the real estate industry; it hasn’t transformed it. The occasion was the purchase of Trulia: both companies made money selling ads to real estate agents eager to get their listings at the top of the two real estate aggregators that were the top two starting points for real estate searches; by emphasizing they were both media companies Zillow could claim they both had many competitors and weren’t competitive with real estate agents all at the same time. While real estate transactions in the aggregate are very frequent, for individual buyers and sellers they are very rare. Thus there is little incentive to push for a simpler solution. A real estate transaction is usually the largest transaction most buyers and sellers will undertake, which makes them very risk averse and unwilling to try an unconventional service. There is a lot of regulation and paperwork associated with a real estate transaction, where assistance is very valuable. And, as just noted, transactions are rare, which means there is little incentive to learn how to deal with said regulations and paperwork on your own. Combine the reticence of consumers to push for change with the local realtor association-controlled MLSs, and a willingness by realtors to punish anyone changing the status quo (by not showing a house, or pointing out flaws that would kill a sale), and the best outcome for Zillow was to be an aggregator but not an integrator: the company was completely removed from the purchase process. Formally, the law of conservation of attractive profits states that in the value chain there is a requisite juxtaposition of modular and interdependent architectures, and of reciprocal processes of commoditization and de-commoditization, commoditization, that exists in order to optimize the performance of what is not good enough. The law states that when modularity and commoditization cause attractive profits to disappear at one stage in the value chain, the opportunity to earn attractive profits with proprietary products will usually emerge at an adjacent stage. If you think about it in a hardware context, because historically the microprocessor had not been good enough, then its architecture inside was proprietary and optimized and that meant that the computer’s architecture had to be modular and conformable to allow the microprocessor to be optimized. But in a little hand held device like the RIM BlackBerry, it’s the device itself that’s not good enough, and you therefore cannot have a one-size-fits-all Intel processor inside of a BlackBerry, but instead, the processor itself has to be modular and conformable so that it has on it only the functionality that the BlackBerry needs and none of the functionality that it doesn’t need. So again, one side or the other needs to be modular and conformable to optimize what’s not good enough. The PC is a modular system whose integrated parts earn all the profit. 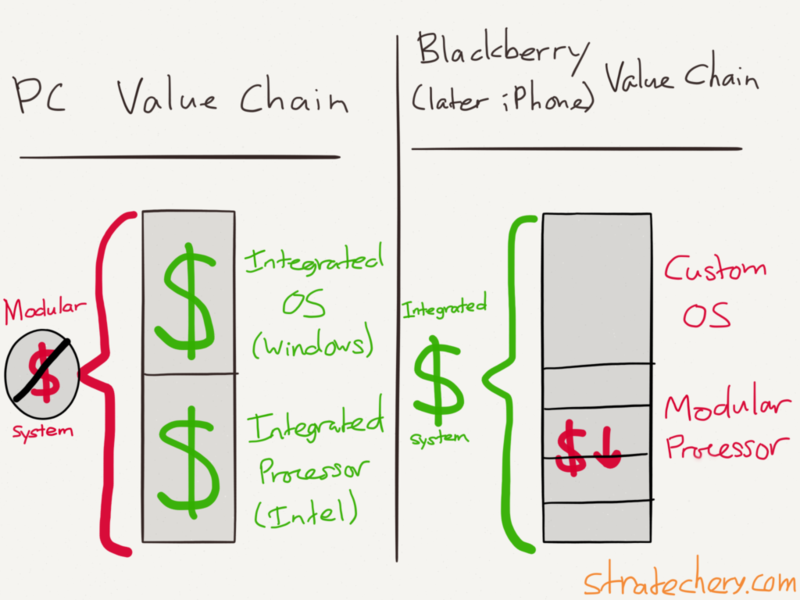 Blackberry (and later iPhones) on the other hand was an integrated system that used modular pieces. Do note that this is a drastically simplified illustration. More broadly, breaking up a formerly integrated system — commoditizing and modularizing it — destroys incumbent value while simultaneously allowing a new entrant to integrate a different part of the value chain and thus capture new value. Commoditizing an incumbent’s integration allows a new entrant to create new integrations — and profit — elsewhere in the value chain. This is exactly what is happening with Airbnb, Uber, and Netflix too. This is the original piece of Aggregation Theory that was missing from last year’s Defining Aggregators: it is one thing to sit on top of an existing industry and, well, be a media company/lead generation tool. There have been a whole host of businesses that did exactly that, and while there is plenty of money to be made, without some sort of integration into the value chain of the industry itself they simply aren’t transformative. 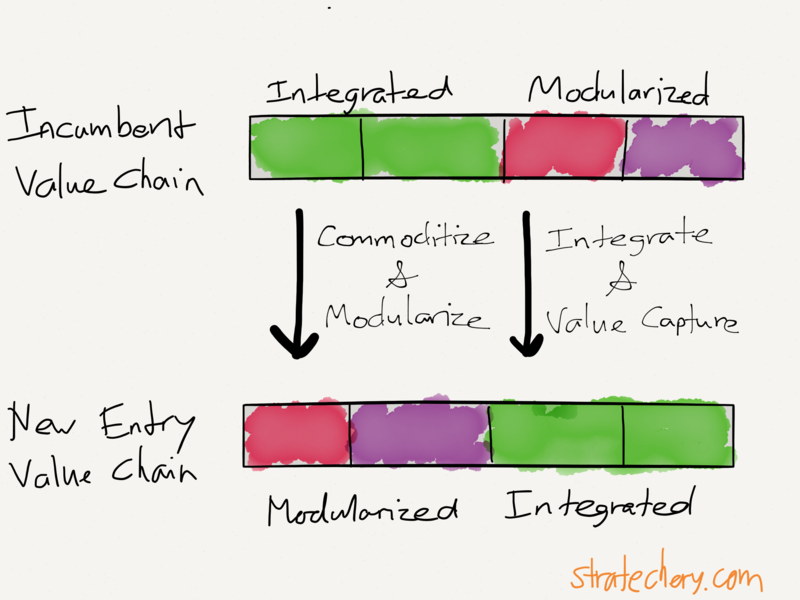 To put it another way, aggregation doesn’t transform value chains; integration does. The companies, which rely on advertising from real estate agents for the bulk of their revenues, are being careful about how they discuss the future of their combined efforts. This is why last week’s news was such a surprise, to me anyways; granted, Zillow had been experimenting with facilitating sales to investors, but to fundamentally change your capital structure, margin profile, and compete with your customers in one fell swoop feels like something else entirely — and Wall Street agreed! I can, though, see where Zillow is coming from: no one thinks the North American real estate market is the way it is because that is somehow optimal or good for consumers; the only folks that benefit from the status quo are real estate agents that continue to collect 6% of the purchase price even as their responsibilities, particularly in the case of the buying agent, run in the opposite direction of their incentives. Zillow did well to capture a portion of that 6% for itself through its realtor ad model, but that only meant that Zillow was as dependent on the status quo as the realtors. To be sure, Zillow has long been a better bet than Redfin, which has admirably IPO’d with a business that basically adds a tech layer (and thus superior lead generation) to a traditional real estate agency; the reality is that simply adding a tech layer doesn’t change industries — that requires new business models. This, though, is where Opendoor, the startup I wrote about in 2016, is compelling: buying houses with the click-of-a-button solves a major problem for sellers, the most disadvantaged party in the entire value chain under the status quo (and thus the most open to something new). And, by definition, it means the company (and competitors like OfferPad) are involved with the transaction that drives the value chain — the actual buying and selling of homes. Make no mistake, the business model is risky, but that is another way of saying the potential return is massive as well: truly becoming a market maker for an industry that does $900 billion worth of transactions every year has massive upside. And, by extension, massive downside for the status quo — which again, includes Zillow. That is one reason to act. Even so, that might not have been enough for Zillow to make such a shift: remember, this is a public company accountable to shareholders, and sometimes doubling down is the most prudent course of action. That, though, is why I spent so much time discussing integration: there is a massive amount of upside for Zillow in this move as well. This absolutely could go sidewise: Zillow is already being hammered in the stock market — investors aren’t generally fans of high-margin companies entering low-margin businesses, with huge amounts of volatility risk to boot. Moreover, Zillow is embracing a model that, should it be successful, tears down the status quo: this will not only enrage Zillow’s customers, but also endanger Zillow’s primary revenue stream. I will certainly be watching closely: how Zillow fares will result in lessons that may be applicable broadly. Think of Spotify, for example: I was a bit bearish on the company last month because of the power of Spotify’s suppliers; the bull case is that Spotify’s ownership of the customer relationship will allow the company to build out the capability to sidestep the record labels even as the record labels can’t punish Spotify because they need them. That’s exactly what Zillow is testing right now: just how much power comes from being an Aggregator, and how much an industry can be transformed when that power is wielded.